They are the Environmental Impact Assessment (EIA) being reviewed by the Environmental Protection Agency (EPA) and the granting of a production license by the Guyana Geology and Mines Commission (GGMC). Country Manager for ExxonMobil, Jeff Simon said his company was awaiting approval of the production plan, production license and EIA. He said regulatory authorities have been seeking clarifications on the documents submitted. “There has been quite a bit. I think they have engaged some additional help and those parties have come back to us for a lot of additional information so it is still being analysed,” he told reporters. 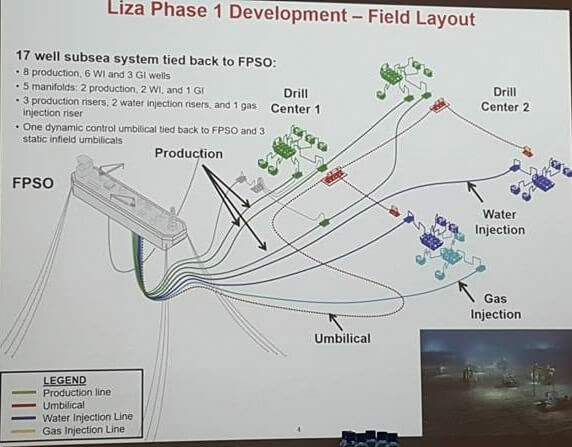 Simon said so far about US$1 billion have been spent on exploration, but the FID would see the company spending up to about US$5 billion before beginning production at 100,000 barrels per day in 2020. “Typically, when you are talking about these magnitude of investments, you want some certainty that everything is gonna be going okay getting the appropriate permits and approvals,” he said. Simon acknowledged that ExxonMobil and its partners have already engaged in a number of preparations, but said the expected approvals are key. EPA Director of Public Awareness, Sharifa Razack and Commissioner of the Guyana Geology and Mines Commission, Newell Dennison told Demerara Waves Online News that overseas experts are assisting in the review of the EIA and the application for a production license. “Since it (application for production license) was received, we have been vigorously pursuing its review and we have sought the assistance of overseas experts,” Dennison said. Razack said the 9o-day period for public comment on the EIA application ended on April 29 and the review, which is also being done by experts from the Canada-based Pal Aerospace, has to be eventually taken to the Environmental Board. “At this point, we are focused on conducting a thorough review of the EIA Report both in-house and with the aid of experts external to the EPA,” she said. The EPA received little more than 100 comments about ExxonMobil’s EIA. The EPA, she said, hopes to in another few weeks say when the EIA review will be completed before it is sent for subsequent stages in the authorisation process. Meanwhile, the ExxonMobil Country Manager said his company would not be awaiting the outcome of Guyana’s next general and regional elections before beginning oil production in 2020- the same year the polls are due. “No! We operate everywhere for really long periods of times through many, many governments so the project and the economics of the project are predicated on the schedule that you see and we are going forward,” he said. Public and Government Affairs Director at Esso Exploration and Production Guyana Ltd-subsidiary of ExxonMobil Corporation- Carlton James, noted that there was “no loss of momentum in our relations with the government” during the change of administrations at the May 11, 2015 general and regional elections. ExxonMobil has found almost 2 billion barrels of oil offshore Guyana at Liza, Snoek and Payara. The Country Manager assured that there are numerous pressuring-testing procedures and mechanisms, including gauges, to prevent and identify possible leakages.